I hadn’t planned on this being the title or subject of my blog for this month (if truth be told, I had planned it for late January or even February – but life got in the way, and I got frustrated with the photos I was adding that were not playing ball); however, as I sat at my sewing machine a few weeks ago, my exploits / tasks seemed like a good thing to right about. You may have seen a photo of me in panto last year – I was Fairy Blossom and I loved that costume. It is known at the group that I like to sew (and crochet), and so it seemed only logical that I would be wardrobe mistress this year. I don’t think I’ve done a very good job this year as wardrobe mistress. 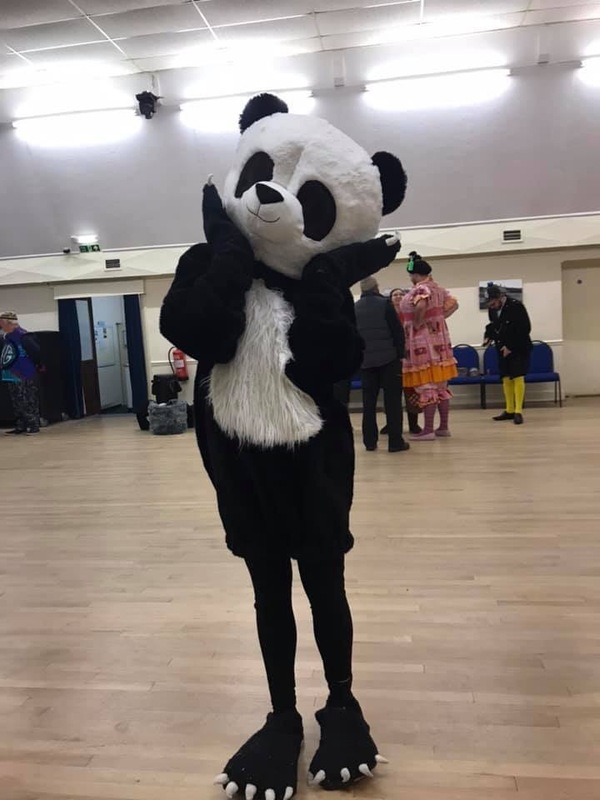 Luckily, we have hundreds of items of clothing, and our producer / director had already picked out all the costumes that are suitable for our production. There has not been so much for me to do – until this week. I had already got a costume that needed a little alteration – the emperor wanted wider sleeves, so I needed to find a picture of a traditional emperor’s robes, to get the idea as to how to make the necessary alterations. I managed to do this, and add a border to the end of the sleeves. 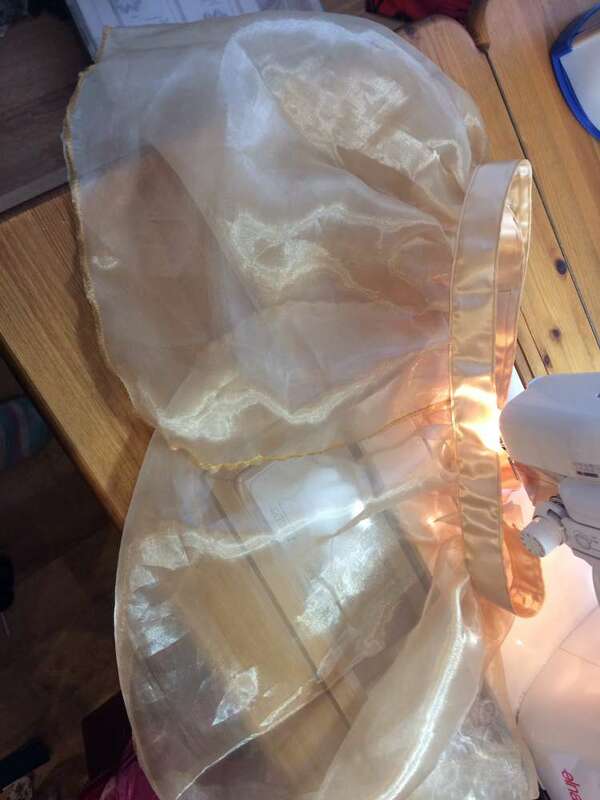 The lengthened sleeves for the Emperor’s costume – he made the hat / headdress himself. The next challenge was taking in some jackets, so that they would fit some young people, rather than being for teenagers or small adults. 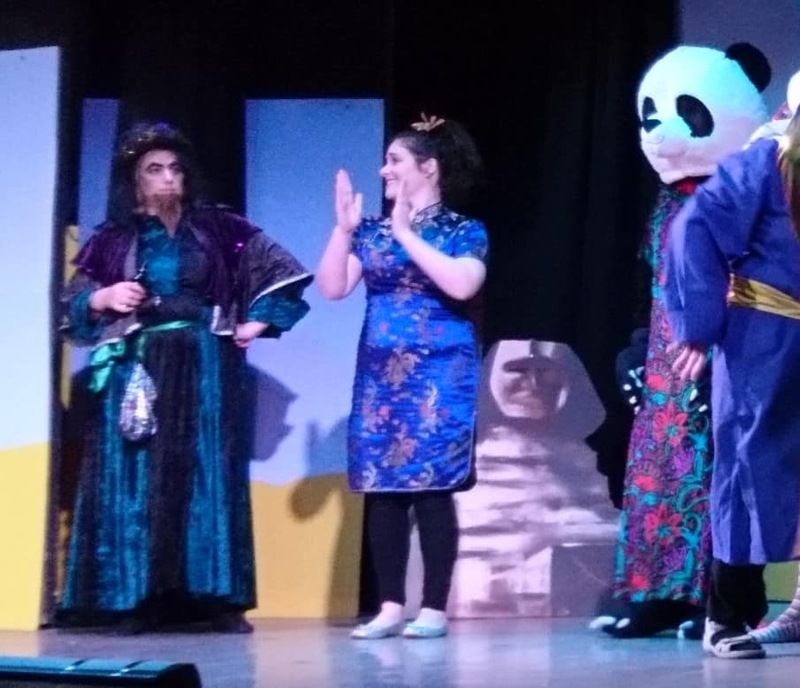 As one of the actors is under 10 years old, the alteration was substantial; the challenge I faced was making the necessary alterations, without cutting the costume, as the next time we use these costumes they are likely to be worn by older members. Therefore I didn’t want to make extreme changes that would be difficult to change back later. The biggest challenge – and the subject of this blog – is making a pair of trousers. Now, some people may be thinking that this is not a big deal. I am not a dressmaker, I didn’t make any clothes at school – our Textiles lessons included making cushions – using a printed panel and quilting it, and also creating a design and realising it using applique. The only dressmaking I have done is for a ragdoll that I made at a workshop run at Step by Step (this was when Step by Step was based at Aller Cross in South Molton). So, I used this as a basis for the trousers. I knew that I needed a paper pattern, and I had a pair of trousers from the costume store to use as a template. 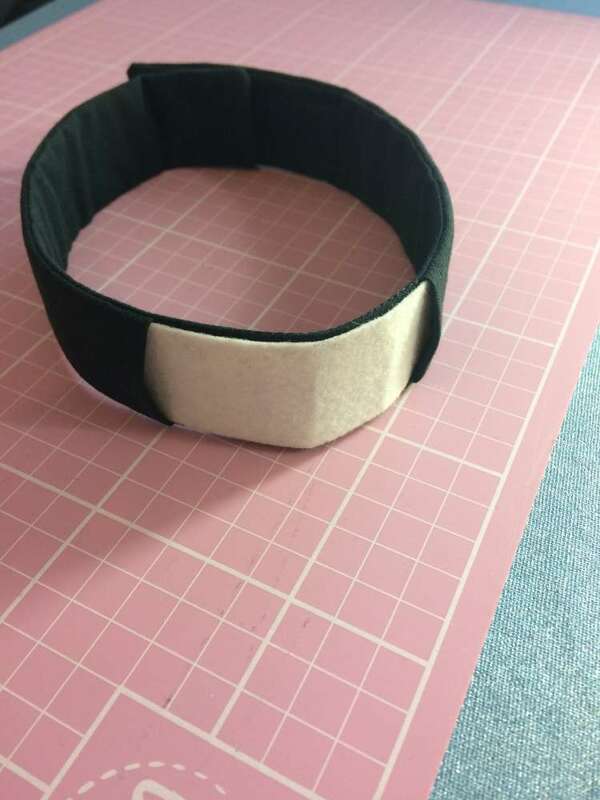 I saw from these that I could make them from just 2 pieces, so I had to take some measurements. 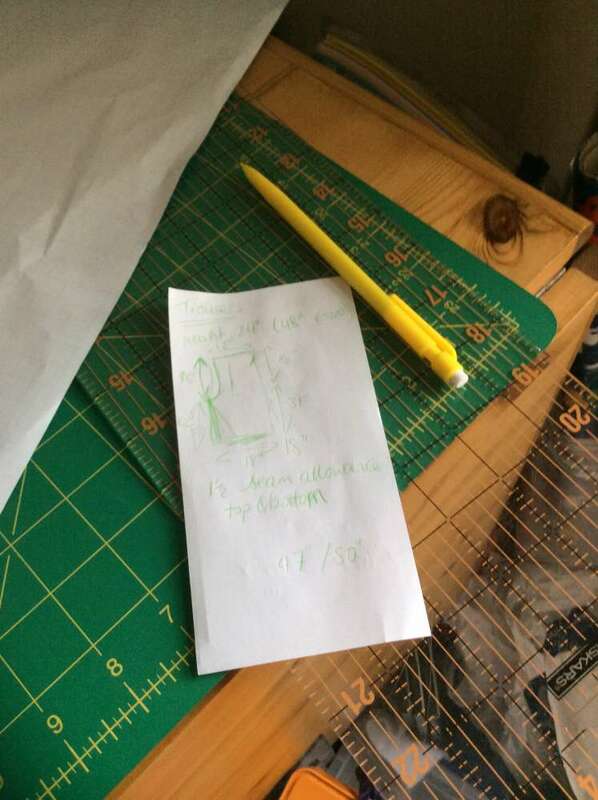 Once I had taken the measurements from the template trousers, I noted them down on paper, giving me a rough sketch as to what the pattern would look like. 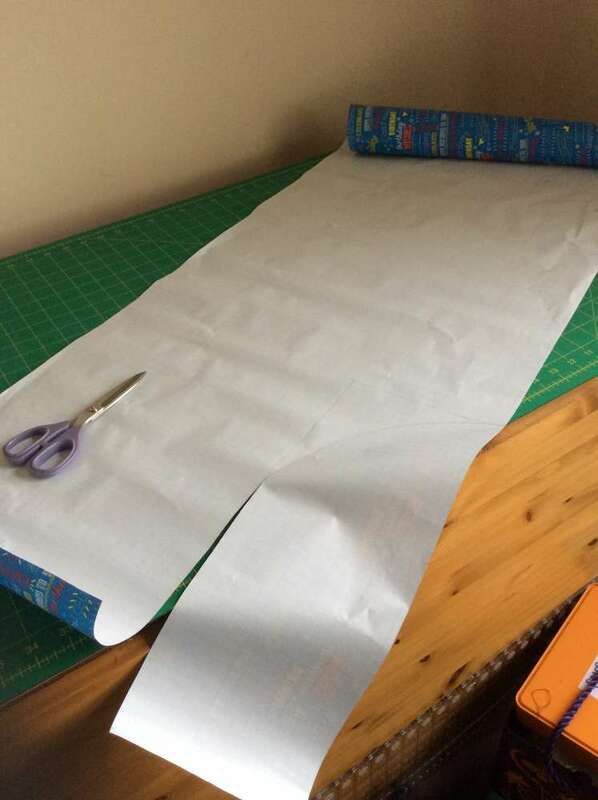 Where to find paper to make a pattern big enough? As someone who likes to make things easy for myself, I chose to make the pattern so that I could place the straight edge of the pattern on the fold of the material – so I didn’t have to think about having a front and a back (either rightly or wrongly). But where do you find paper that is wide enough and that is long enough? I’ll tell you – a roll of wrapping paper! I chose wrapping paper that had squares printed on the back, which made it very easy to draft the pattern and make any necessary changes. Like the title says – necessity is the mother of invention! With the pattern drawn out, I then cut it out, and used chaco markers to draw round the pattern. Then came the cutting out. Like I’ve already said, I like to make things easy on myself – and I don’t always use pins – I sort of ‘wing it’ – and it usually works (although with certain patterns, pinning is essential, and a step I don’t miss out). The pieces looked like they were meant to, and so it came to sewing the legs, and then constructing the trousers. This was easy for me, because of the practise I have had making doll’s clothes – making trousers or bloomers for dolls is probably my favourite part of making dolls clothes, as they are so easy! Once I had constructed the trousers, I checked the internet for information about elastic casing – and discovered that it is just the same as I’d been doing for the doll’s clothes. With all the elements (except for elastic) in place, I tried on the trousers – and they seem to be a very good fit – and they are not meant for me! And having written this, I was just thinking about how I could make the trousers bigger around the waist; I realise that I just need to put the template in a bit from the fold of the fabric. Like I said to start with – necessity is the mother of invention. 1. Where there is a will there is a way. Post script: after doing these alterations, I then had to make a bag for my crystal ball – something that would be appropriate for my character, and I also needed a belt. As my costume was mostly black and green (with some silver / grey), a green satin belt seemed appropriate – especially as I had some green satin in my stash. Both of these were quite simple – and my crystal ball bag had an opening on the top edge, so that I could find a way to attach it to my belt. I also thought that it would be a good idea to create a quasi clerical collar, as at the end my character had become so good that I was made a clergyman – and so a clerical collar seemed appropriate! Some after measuring my neck, and then creating the sleeve, I used pieces of pelmet vilene to put inside the sleeve. One of the characters wanted a little net / organza skirt, just to hide her tummy a bit. I used ribbon for the waistband, and some organza from the costume store to create something – and used hook and loop tape (velcro – but other brands are available). Almost at the last minute I was required to alter an existing costume. As you can see by the first photo, the panda has rather skinny legs. I was guided as to how to create legs to add to the body – use the fur fabric, create two tubes (one for each leg), and then sew the legs a couple of inches above the elasticated legs in the costume. I was also advised that the leg bottoms didn’t need to be finished – that they could be raw edge. This was actually my second time of using fur fabric (now I think about it) – I now recall inserting a triangle of fur fabric into a pair of trousers / jeans for one of my stepsons for a New Year’s Eve fancy dress costume. I don’t remember the fur being so difficult to work with before – and it certainly sheds a lot! Mind you – the overall effect was certainly worthwhile. 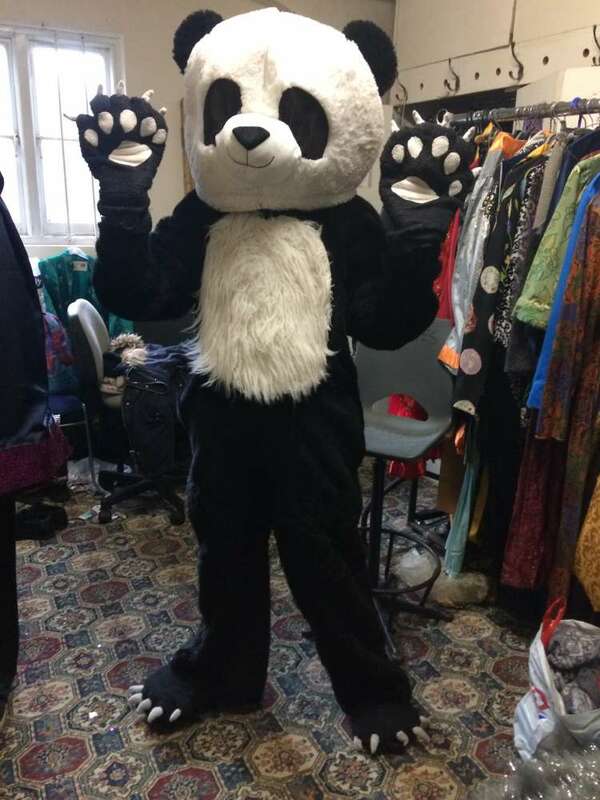 Costume adjusted – with legs added! In addition to the legs for the panda – we had to come up with a polar neck jumper / shirt (it was at this point I realised the spelling difference between polar neck and polo neck – having previously thought the sound to be too similar to be different, and yet wondering how you could differentiate between the two). What to do? I’d forgotten to have a look in the local supermarket (even though I’d thought about it just moments before stepping into the shop). I needed something – and an old jumper that belonged to my husband came to the rescue. I just needed to cut the sleeves off, and cut most of the torso off – to create something like a ‘dickey’ – like Howard Wolowitz wears in The Big Bang Theory. Like the title says – necessity is the mother of all invention. 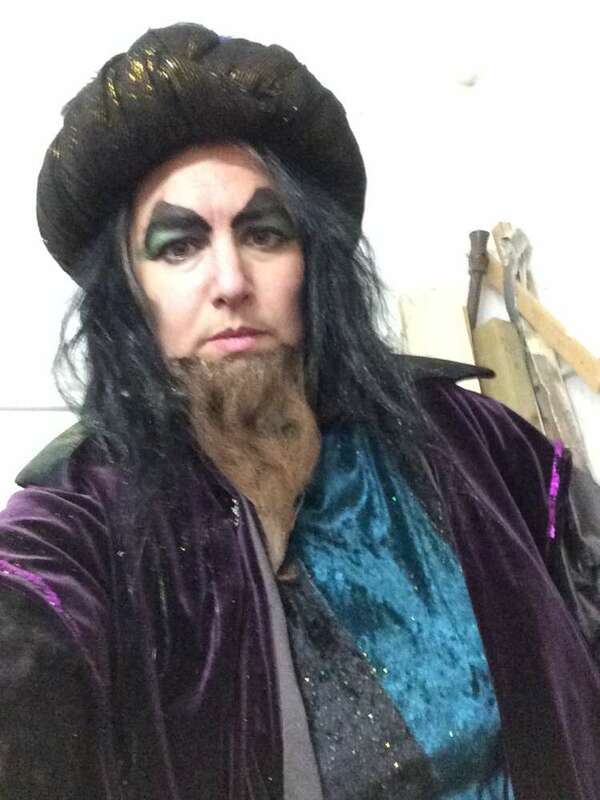 As a parting ‘gift’ – pictures of me in costume – warning – they really are not pretty pictures! I don’t look very impressed by the Sand Dance / Old Bazaar in Cairo…guess which one I am! Oh, and can you spot the bag for the crystal ball?! The last performance, and I had glitter emptied on me…I may not look impressed, but I loved every minute of the show – and I’m still finding glitter now! 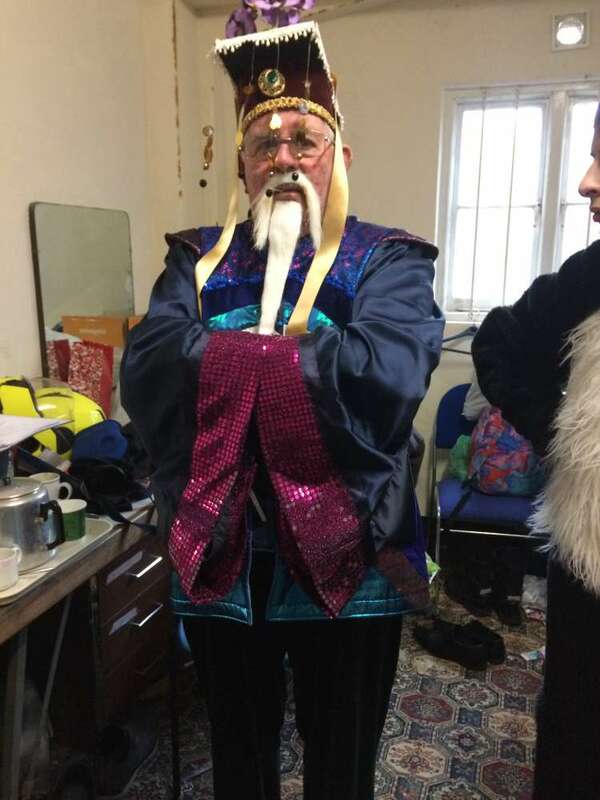 Ever the professional – I had to stay in character, even for the photos! 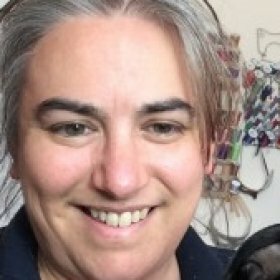 My Crazy Quilting Learning Journey My story so far Keeping my sanity – Nina, an introduction New Year, New Skills, New Challenges.